MASKerade: Muse 19 - Thank You! Muse 19 - Thank You! Let me start by saying that this card is dedicated to all of you who wished me a Happy Birthday yesterday. THANK YOU SO VERY, VERY MUCH. I can honestly say it is a day I will remember always. To those of you who participated in Darnell's surprise Birthday Party (which is continuing until June 15th if you want to play along - longest (and best!) birthday EVER! ), thank you so much for taking the time to make me a birthday card, and for all the good wishes and kind words. To Jackie and Geri, the co conspirators and to Darnell, the initiator, MWAH! You really surprised me, my friends, and I so appreciate all the effort you went to! I used a bold black Ditto sentiment and then created a circle around the sentiment with different sized circles. Same idea as Michelle's folk-art card, but by using bolder colours and a regular shape, this card has quite a different feel. *Turtles are an American candy of chocolate, caramel and pecans. Someone sent some to Michelle in Australia and she said on her blog how much she liked them. So I sent her the recipe to make home made "Sweet Georgia Browns" - the Canadian version. Oh my word, they are YUMMY! Here's the recipe if you're interested (I recommend cutting out the salt). Ardyth so glad you enjoyed your birthday celebration and wow you knocked this out of the park again. Thanks for the recipe, the Purdy's 'Sweet Georgia Browns' are very yummy, this recipe might be the end of me. Thank you for becoming a follower. So glad you enjoyed your birthday and love your "muse" card. Ardyth - I'm so glad you had a fabulous birthday! 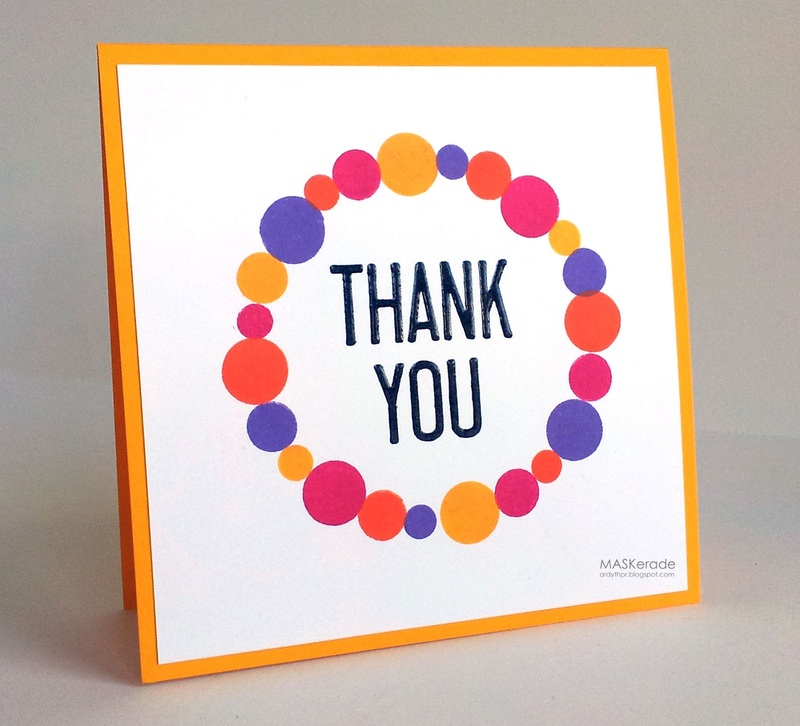 Love, love, love your card...the circles are fabulous! Happy Belated Birthday MF...hope it was a good one! You are very welcome. 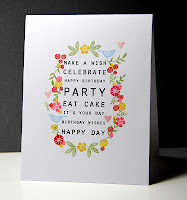 I was so happy to be invited to your birthday party--it was the place to be yesterday in blog land. And, what an incredible inspirational gallery all your friends created. I could case for months. You are so very welcome, Ardy, my friend! It was such a joy to do this for you after your special anniversary treat for me, especially since we were able to pull off the surprise! In case others read these comments, I want to make sure your readers know that the party is continuing on my blog (djkardkreations.com) until June 15th so your friends can continue to surprise you! Maybe you could edit your post to mention that in case people don't read this. I want you to keep having birthday fun!! Your thank you card as a take on the MUSE card, what can I say? Mwah! Your recipe enabling me to improve on my quest for largess, Mwah-Mwah! I'm so glad you had such a wonderful "Cyber Birthday Celebration", Ardyth! You certainly deserve it! When I first looked at your card, I thought of those candy necklaces (speaking of candy) with all those fun colors! Such a great take on the Muse card...and a perfect thank you! You are truly deserving of this celebration Ardyth! Wasn't Darnell's idea the most fabulous way to wish you a happy day and to thank you for your commitment and never ending source of inspiration that you share with us? I see you nodding your head 'yes'! These beautifully vibrant and festive colors totally captures the mood of a fun party! Like my Baba would say.... "a lovely lunch was served and a good time was had by all!" Ardyth...Happy Birthday again! You are so welcome. It was a fabulous party wasn't it...so much fun and love in one place. Darnell, Geri and Jackie are amazing ladies to do this and I was so honored to be asked to attend. Wishing you a wonderful year! Glad you enjoyed your birthday surprise Ardyth! Your card is so fun and I love that bold sentiment! So interesting to see the ways people are inspired! This is so neat. I love how bright and bold it is...and that embossed sentiment is a great touch! Brilliant take on the Muse card - love the balance & colors!